TB-406: Full size tour-pak bag. Simply lift your luggage bag out of the tour-pak to move your cargo easily into the hotel, campground or to unload fast once you're home. Fully lined with multiple sections for ogranized packing, this bag features a full size bottom compartment for packing all your personal belongings. 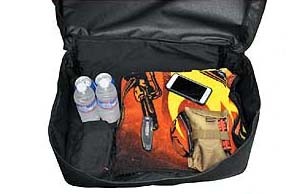 The top lid has multiple pockets and a concealed pocket along with a protective pocket for sunglasses, iPod, iPhone, etc. Made in the USA. Black. 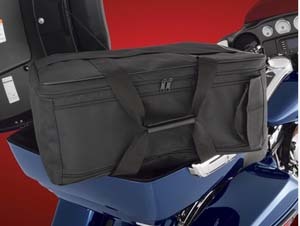 Also see our companion pieces...SBL-408 Saddlebag Liners. TB-407: Similar to above but in tan. Also see our companion pieces...SBL-409. 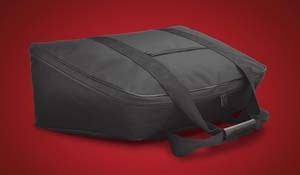 TB-CEE: High quality constructed bag is designed for durability to meet the needs of everyday riders. Material used is heavy duty polyester cross-weave with a durable PVC vinyl backing. TBL-IS: This "Weekender" tour pack suitcases offer a number of options for riders that a large single bag won't. 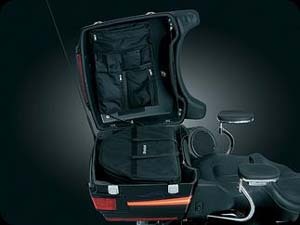 Although sold as singles, the rider can stack two in a King Tour Pack which equals the volume of the typical large bag, but in a much more manageable form. Each person has their own suitcase rather than both parties clothes mixed together. Each bag is large but easy to carry unlike the heavy and bulky single bag. If you ride with a "chopped" or a "razor" tourpack, a single "Weekender" bag is the perfect choice for your travel needs. You can even bungee one on your tour pack lid rack, keep one inside giving you the same total volume as the bulky large single bag which may have come with your bike but now you have several inches between the top of the "Weekend" and the inside of your tour pack lid. This great for shopping or storing your leather jackets, half helmets etc. and you can still close your tour pack lid which you cannot do with the large single bag. TB-BB: Another must have accessory for the Harley FLH. 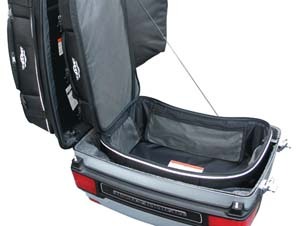 With over 2 cubic feet of storage, this 23’’ x 16’’ x 9½’’ Trunk Liner Bag allows you to fill your trunk easily, quickly, and maximizing the Harley FLH trunk space. A unique double zipper makes packing and access extremely simple from the top or from the side. By using the side zipper, the Trunk LinerBag opens the full side profile of the bag to allow maximum suitcase style packing. 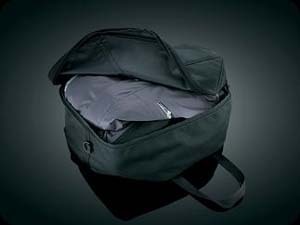 An additional six inch double sided top zipper provides a handy top flap allowing access to special items without having to unpack the whole bag. Comes with carry handles and side pocket. 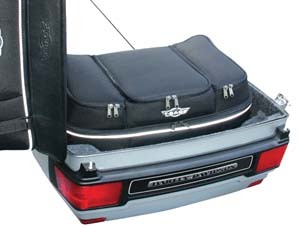 Designed for use with Harley FLH trunks, but also fits the Indian Roadmaster and GL1500 Goldwing. TRUNK LINER, 23" x 16" x 9.5". Can be compressed down for use with Chopped Tour-paks. TB-BC: A Beautiful designed suitcase with large main storage cavity (5 inside pockets) and 3 large external lid compartments for easy access to smaller items. The Bootcase has a reflective rain cover and detachable shoulder strap. 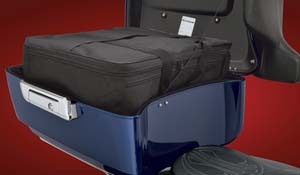 The Bootcase is available separately for inside the Tour Pak or for luggage rack mounting. With or without a luggage rack, the Bootcase attaches perfectly to your King or Chopped Tour Pak AND it fits perfectly inside the King Tour Pak too. Quality materials & workmanship PLUS the solution to carrying luggage and a rackless Tour Pak. Note: Will not fit with Tour-pak Lid Organizer because the product fits perfectly in the Tour-pak. 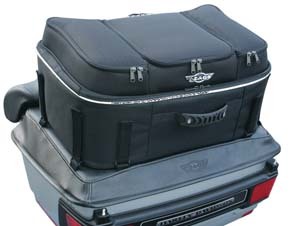 TB-LL: The soft trunk liner bag is contoured to fit perfectly inside the Harley Davidson King Tour Pak. It has 2 inside mesh pockets, 2 lid pockets and a built in support to keep the bottom of the bag rigid. 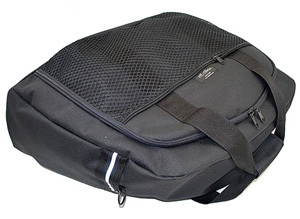 The bag has a convenient carrying handle and a detachable shoulder strap for easy carrying. Four rubber foot pads protect the bottom from asphalt scuffing. TK-LL: Your Tour-Pak is a big, open space. Organize it with our Tour-Pak Liner. The best part? When you get where your going, you can unload everything in one trip. Just grab the handle & pull the black Cordura liner out, then sling it over your shoulder & carry it to wherever you're staying. Dim: 21” Wide, 15” Tall x 8” Deep. 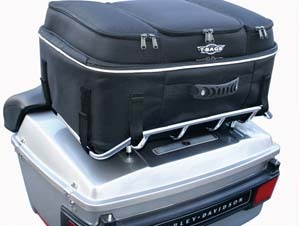 TB-VY: Trunk Liner Bag for the Victory Cross Country. 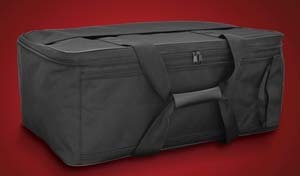 This 20’’ x 17 ½“x 8’’ Trunk Liner Bag allows you tofill the uniquely shaped tapered Victory trunk quickly and efficiently. 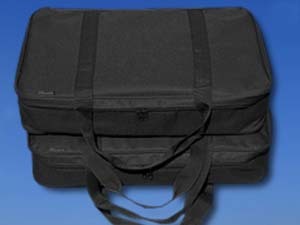 A full length zippered top makes packing and retrieving items simple and convenient. In addition to the generous main storage area is a separate 8” x 12” zippered compartmentallowing quick access to personal items. Designed for use with Victory Cross Country Trunks. 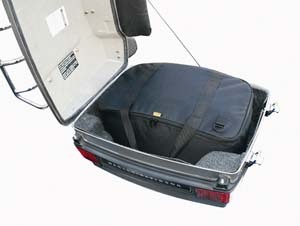 8" x 17.5" x 20", For Victory Cross Country Trunk, 2010+.